We offer SAP Document Presentment Live implementations for any industry. 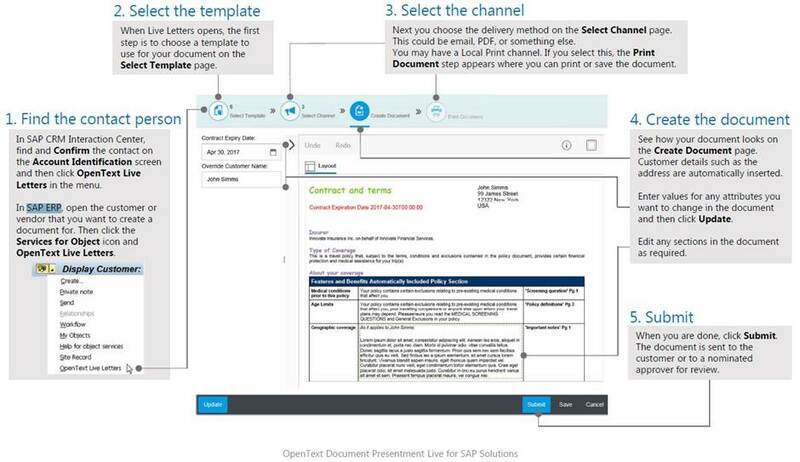 OpenText™ Document Presentment Live for SAP® Solutions helps organizations to create highly personalized, yet professionally laid out and approved documents. Document Presentment Live seamlessly integrates into SAP systems like SAP CRM Interaction Center or SAP ERP. With Document Presentment Live, users can create and send documents driven by immediate customer contact. Learn more about SAP & OpenText alliance here. Live Letters is the core feature of Document Presentment Live. Live Letters lets users create and edit documents such as campaign letters, offers, contract notes, and other types of end-customer communications from your corporation or organization. Business data is merged into the document, users choose a template, select the method of delivery (PDF, HTML, AFP-print, etc. ), and add personalized messages. Documents can then be delivered via mail or electronically. Document Presentment Live can be integrated and customized in many ways to fit the needs of your organization. You can implement it in SAP CRM Interaction Center, SAP ERP, SAP Fiori Live Letters. The Live letters process is securely managed by active directory management and has a approvals and security built in out of the box. Through the entire procedure you can edit, update, and then submit saved or rejected documents with the Live Reviewer. Let us know how we can help you interact and enhance your customer communication needs, we will take it to the next level.